Apple iPhone Nano Coming Soon to the Market ? Is that our dream phone approaching the real life? Yes! Rumors are heating up for Apple’s new iPhone Nano. The new iphone may looks elegant with its 2.75 inch screen, multi touch and also consists of ipod with 4/8 GB. 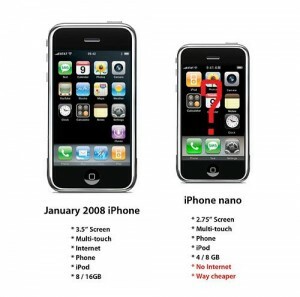 The iPhone Nano will be smaller than Apple’s first generation precursor and they will be cheaper too(Not so sure). All the above reports are reported recently but the latest hearsay about the Apple’s new iPhone Nano makes us to believe that the phone is hitting the market soon. Vaja, a highly regarded mobile phone case manufacturer, well-known for their quality leather cases products started selling some cases related to iPhone Nano. This reputed manufacturer has entered iPhone Nano in their site list. Previously some other case producers also added iPhone Nano to their sites, but this news gives us a hint that the iPhone Nano is a real-time product and is imminent. Some blog sources have reported that the Apple’s new iPhone Nano will not have 3G and about the release of the product nothing is deep-rooted yet.